It’s not too late to get your last fix for the season. 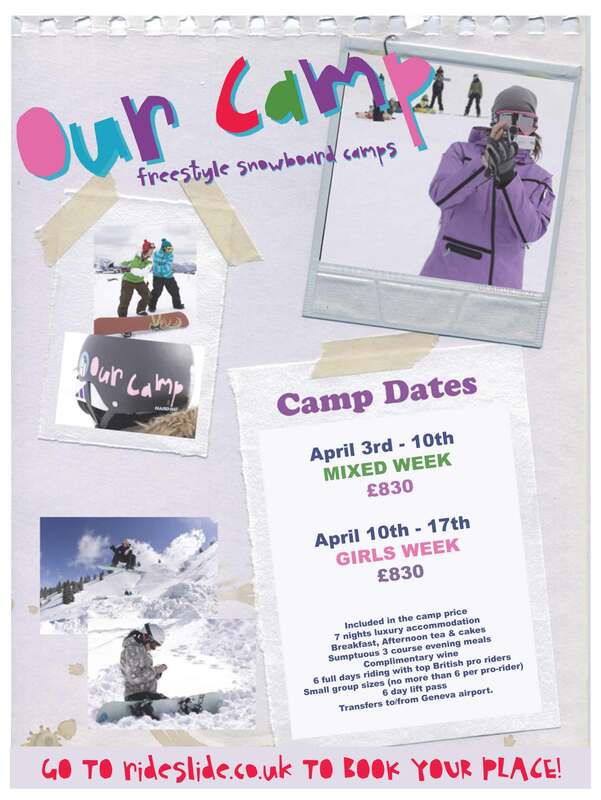 OurCamp freestyle camps are running from Sunday 3rd April for the mixed camp, and Sunday 10th April for the ladies only camp. Based in Morzine at the Ride & Slide flagship Chalet Guytaune (www.rideslide.co.uk/chalet-guytaune.html) the camps offer a great way of getting in to your freestyle riding or improving if you’re already giving it a go. The aim of the week is for the campers to spend time riding with the pro’s, picking up hints and tips, trying new things, and generally getting you in to your freestyle riding. The coaching is provided from Monday-Saturday inclusive and in addition to riding with the OurCamp pro riders campers will also receive tuition from a current BASI Snowboard trainer with BASI Snowboard level 4 I.S.T.D. • Transfers to/from Geneva airport. Contact Jon at Ride & Slide using info@rideslide.co.uk for more details.